NEW EPSON projector wireless LAN unit ELPAP 07 genuine from JAPAN. Our products are 100% authentic. 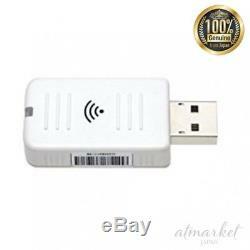 Wireless LAN unit that can be easily attached to the projector. USB unit type IEEE802.11b (1 to 14 ch), IEEE802.11 g / n (1 to 13 ch) compatible. Five Promises of Our Shop. We are the careful packing. We can try to find other Japanese products if you wish. We highly recommend using EMS service for safety and smoothly. Especially t o South America and Africa. All of my item is genuine item, I never sell any kind of third party item. International Buyers - Please Note. We will find any item for you. The item "NEW EPSON projector wireless LAN unit ELPAP 07 genuine from JAPAN" is in sale since Saturday, July 28, 2018. This item is in the category "Consumer Electronics\TV, Video & Home Audio\TV & Video\Home Theater Projectors".